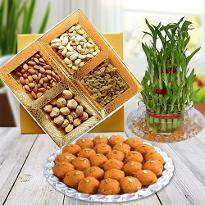 Make Diwali festival more enthusiastic by sending sweets online. 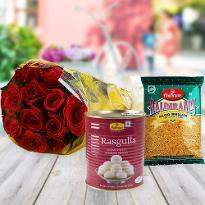 We have a variety of online Diwali sweets. All these sweets are prepared using the richest quality of ingredients while keeping in mind the health of your near and dear ones. In India, celebration begins with a luscious treat and what could be more luscious then sweets? Sweets are the awesome delights that can satiate the taste buds of everyone. 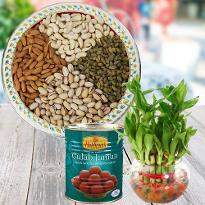 They are considered to be the best Diwali gift which you can undoubtedly gift to your dear ones on Diwali festive. So, go ahead and buy Diwali sweets online and send for a hassle-free delivery. Diwali is an occasion of sharing love and scrumptious sweets with your near and dear ones. Such kind of luscious delights are the traditional concept that has been carried on for generations. If you are looking for a gift that entails deliciousness and lusciousness, then Diwali sweets are the ideal choice. Diwali celebration is all about get-together of friends, families, relatives and special ones. It’s a wonderful festival of joy and happiness. Diwali festival welcomes wealth, prosperity, peace and a new beginning to your goals. It’s a festival of sharing happiness. So, share your happiness with delicious Diwali sweets. The interesting thing about this festival isn’t just only crackers but also the delicious boxes of Diwali sweets. People love to commemorate this festival with great keenness. A mouth-watering sweet gives a kick start to the celebration. Order Diwali sweets online and give a delicious turn to the Diwali celebration. We all know that celebrations in India are incomplete without scrumptious sweets. Enjoy the essence of the authentic Indian sweets that have been made by our team of experts and delivered to your desired destination. Regardless, whether you want to have Motichoor Laddoos, Kaju Katlis, Rasgullas or Gulab Jamuns our online gift portal brings all these delicious sweets . 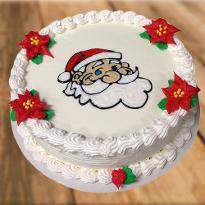 All you have to do is to place your order online for sweets. 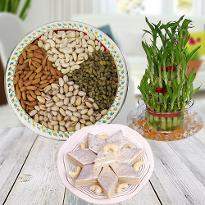 Diwali being a celebration of satisfaction and thriving is commended with extraordinary Diwali sweets. It isn't just an event when you celebrate with the relatives, families or friends, however you additionally celebrate with the general public you live in. Diwali is time when you approach the relatives and individuals you work with. Diwali is very nearly an equivalent word to sweet delicacies. Many people thinks of it as time when you can commemorate with sweets, dry fruits and chocolates. Youngsters enthusiastically sit tight for it as they expect numerous desserts . It’s also the time when they can expect gifts from their dear ones . 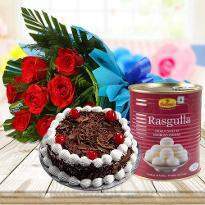 If you are planning to amuse your loved ones on Diwali festival then online Diwali sweets are the ideal gift. Sweets are the ideal way to sweeten the taste buds of dear ones. The richness and goodness of Diwali sweets can infuse more love and warmth between the sender and receiver. 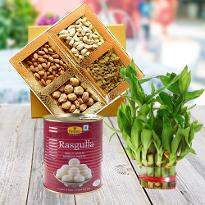 So, you can without any doubt present Diwali sweets to your loved ones on the divine occasion of Diwali festival. Along with Diwali sweets, you can also send chocolates, dry fruits and cakes to enhance the art of gifting. So, don’t wait anymore and place your order for Diwali sweets and gifts now! Diwali is commonly named as the festival of lights. It is one of the most widely commemorated festival in India. Exchanging gifts with dear ones is one of the most integral part of the celebration. Presenting gifts to near and dear ones means sharing love and happiness with them. Sweets are the most delicious element of Diwali commemoration. It is one such festival that removes the negativities from the environment. People lit diyas and candles to remove all the negativities from the surroundings. People even worship idols of Lord Ganesha and Goddess Lakshmi. Sweets are also offered to them. Buy Diwali sweets online and commemorate Diwali with grandeur. Sweets are the richest gift that you can also gift to your friends, families, relatives or dear ones as a token of appreciation and adoration. Buy a scrumptious box of Diwali sweets and gift to your loved ones. 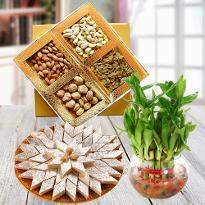 Winni presents a huge range of Diwali sweets. So, browse and choose the desired sweet for your loved ones. 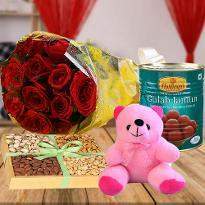 Order and send online to convey your regard to your special ones. There is one thing that enables to heighten the enjoyment of Diwali celebration is the presence of delectable mithais or sweets. Enticing yourself as well as your loved ones with mithais during occasions is simply endearing in every sense. Indulge in a delicious celebration by ordering Diwali Mithai online. Mithais are entirely stress buster and can uplift anyone’s mood. The pleasure to send Diwali Mithai to loved ones who matter to you equals to self-indulging them. This is how one can rejoice the occasion of Diwali by relishing on all kinds of mithais. Be it an Indian mithai or box of chocolates, the sweets hold a special place in the celebrations. Sweets are the relishing way to increase the level of happiness in any event or occasion. People love to consume sweets after meals. , mithais or sweets are the luscious delicacies that have health benefits too. Eating mithai after meals assist in the digestion of food. So, it is the best gift that one can give to their dear ones on the occasion of Diwali. 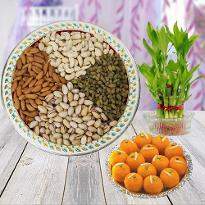 Diwali mithais will serve the purpose of both wishes as well as health benefits. Products in this category have been rated 4.9 out of 5 based on 142 reviews.